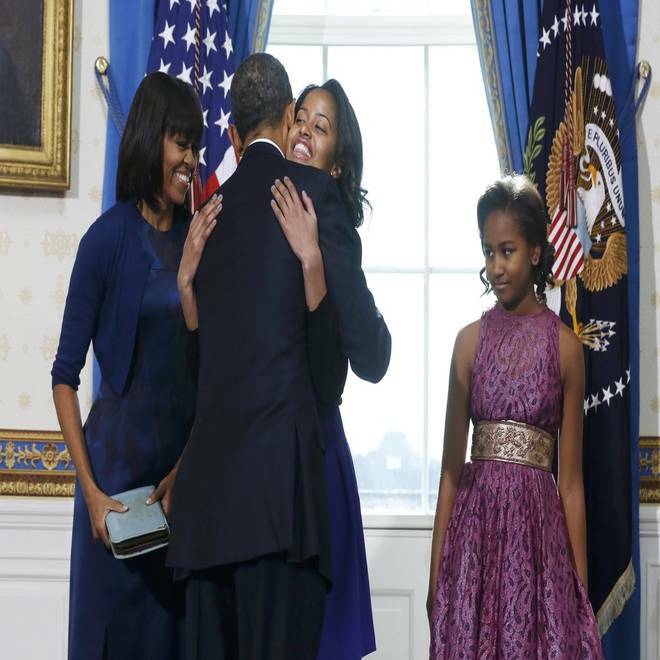 President Barack Obama gets a hug from his daughter Malia as wife Michelle and daughter Sasha looks on in the Blue Room of the White House in Washington, Jan. 20, 2013. President Barack Obama was officially sworn in Sunday for his second term as president of the United States, ahead of Monday's public events. In a small and succinct ceremony at the White House, Obama recited the constitutionally mandated oath of office for the third of four expected times during his time in office. "I did it!" he responded, before she observed "You didn't mess up." Sunday's official swearing-in, administered by Chief Justice John Roberts, was the 57th inauguration of a president in American history. This time, President Obama and Justice Roberts got the words right. The oath took 32 seconds inside the White House. NBC's Peter Alexander reports. Wearing a dark suit and blue tie, Obama repeated the directive to “preserve, protect, and defend the Constitution of the United States." He was joined by First Lady Michelle Obama and his daughters Sasha and Malia. After thanking Roberts and waving to cameras, Obama and the first family left the White House's Blue Room. He will deliver his public inaugural address Monday on the west front of the United States Capitol. During the brief swearing-in Sunday, the first lady -- who wore a dark blue dress -- held the family Bible upon which Obama laid his hand to swear the oath. According to inaugural officials, the Bible was a gift from Mrs. Obama’s father to his mother in 1958. When Obama first took the oath of office on Jan. 20 four years ago, he and Chief Justice John Roberts tripped up over the wording, raising concerns about whether the constitutional requirements were fulfilled to the letter of the law. Roberts went to the White House the next day and administered it again in full. 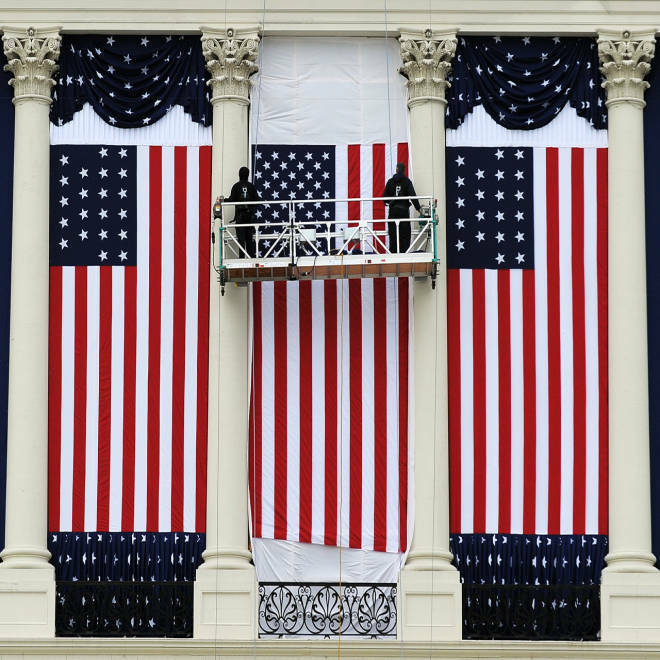 The short Sunday ceremony was held because the constitutionally mandated inauguration date of Jan. 20 falls on a Sunday, so Obama will take the oath a fourth and final time on Monday before hundreds of thousands of observers on the National Mall. America may be politically divided, but most Americans report really liking Michelle Obama, who counts helping military families among her key initiatives. NBC's Kristen Welker reports. The Monday ceremonies will include the president's inaugural address, a luncheon with the president and members of Congress and the traditional inaugural parade and balls. Ahead of the ceremony, the Obama family attended church at the Metropolitan African Methodist Episcopal Church in Washington , a historic place of worship that also hosted pre-inaugural services for former President Bill Clinton and Vice President Albert Gore. Vice President Joe Biden was officially sworn in at about 8:20 a.m. ET Sunday. The small weekend ceremonies for both men are a bit of a historical quirk, although today's swearing-in was the seventh in history to take place on a Sunday. The last instance occurred in 1985, when President Ronald Reagan was formally sworn in for his second term in office. Beginning with the second inauguration of Franklin D. Roosevelt in 1937, new presidents and vice presidents have been sworn in on Jan. 20 due to the changes laid out in the 20th Amendment to the Constitution. (Before that, inaugurations were typically held on March 4, as directed by the 12th Amendment. But controversy over the length of the lame duck period forced that ceremony to be moved up by law). Festivities for President Barack Obama's second inauguration. In addition, eight vice presidents have been administered the oath of office upon the death of a president. The hastily planned ceremonies have taken place in hotels, homes and -- famously, after the death of John F. Kennedy -- aboard Air Force One. The oath of office for the president is set out in the Constitution. Article II, Section 1, states as follows "Before he enter on the execution of his office, he shall take the following oath or affirmation: -- "I do solemnly swear (or affirm) that I will faithfully execute the office of president of the United States, and will to the best of my ability, preserve, protect, and defend the Constitution of the United States." Traditionally, two minor changes are made. First, the president taking the oath says his name after the first word ("I, Barack Hussein Obama"). And second, the phrase "so help me God" is added at the end. NBC's Pete Williams and Shawna Thomas contributed to this report.